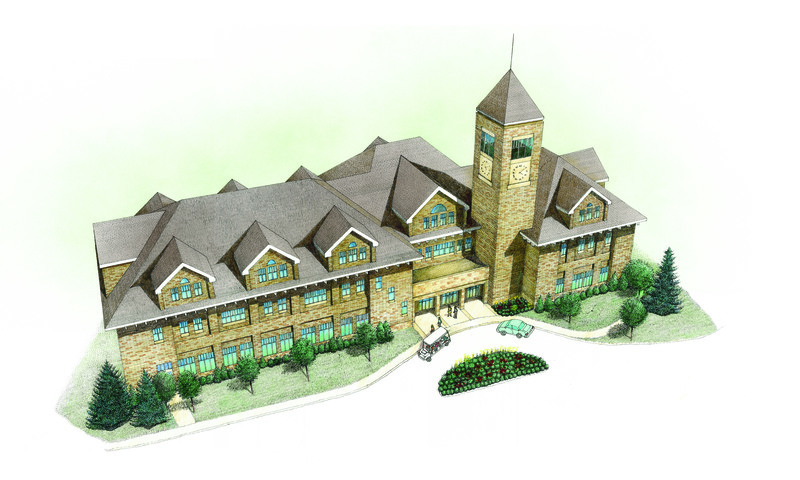 In all, it took little more than a year and a half to raise funds and erect the 83,000-square-foot Gordon B. Hinckley Alumni and Visitors Center, built in tribute to a prophet and dedicated on his 97th birthday. After a whirlwind year of construction, culminating on June 23—the exact date President Hinckley broke ground for the building one year ago—it’s time to open the doors. While the façade may be stunning, the building is a true workhorse, serving as a home for alumni, a destination for BYU visitors, and a memorial to a beloved prophet. 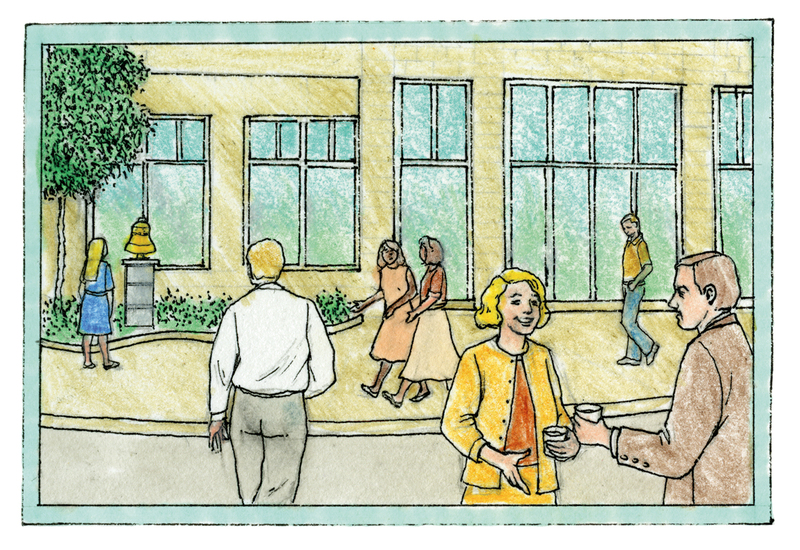 It will host hundreds of events each year, from reunions to conferences to lectures, but that doesn’t mean you need an invitation to enter. Students past and present are encouraged to visit often. 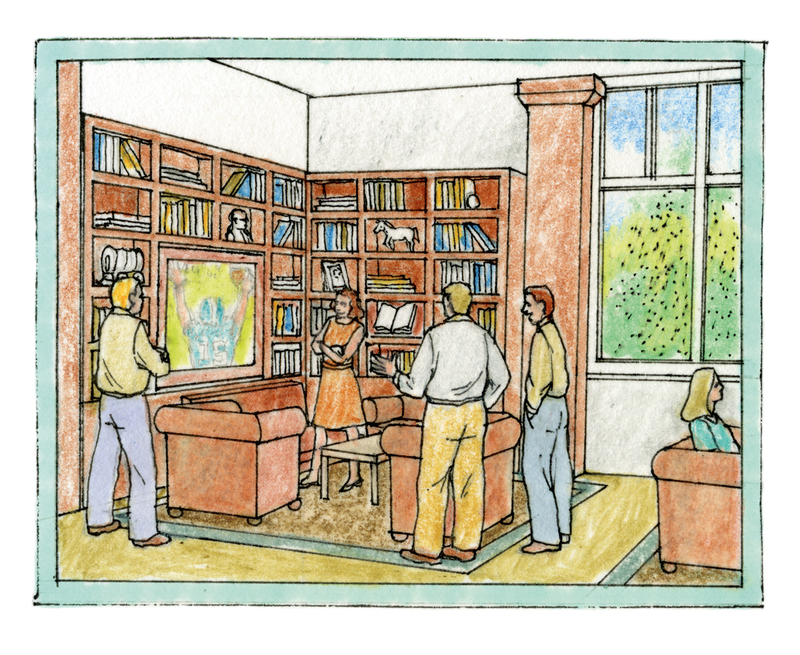 “It’s a place for alumni to come home to,” says John C. Lewis (BA ’77), associate advancement vice president for alumni and external relations, and a great deal of work has gone into making the interior comfortable, practical, and educational. In addition, the building will stand as a hallmark of BYU’s definitive mission, the search for light and truth—“a search we hope to share with others as they leave this place,” Lewis says. Comfortable leather couches cluster around a freestanding rockwork fireplace, and melodies from a grand piano waft over light-hearted conversation in the family room—the heart of the Hinckley Center. The room captures the ambience of a home, while large windows offer a friendly reminder that you’re still enveloped in BYU and the greater Utah Valley. Sit back, relax, and watch a game on a flat-screen plasma TV in the den (left) or gather with old friends near the warm fire. With an outdoor patio, a fresh-cut lawn, and fragrant lilacs and daphnes, it seems the only thing missing in the Hinckley Center backyard is the barbecue. There is also a bronze 280-pound replica of the Nauvoo Bell, donated to BYU by Larry H. and Gail S. Miller in 2001. The bell faces the focal point of the backyard, a gazebo 16 feet in diameter and nearly 14 feet tall, tucked between two flowerbeds. A place for workshops, presentations, reunions, and dining, the assembly hall is divisible into three multipurpose rooms, with wall-size window views of the landscape to the east and west. The room features a maple hardwood floor and cherrywood detailing. Glass doors extend activities out to the backyard patio. Upon entrance to the Hinckley Center, a friendly receptionist is on hand to help you navigate the building. In the hallway just to the north is a computer that allows visitors to do information searches and helps them find their way around campus. A stainless-steel time capsule to be tucked inside the wall of the Hinckley Center’s front porch contains President Hinckley’s cuff links, one of his personal hammers, and a signed copy of his book Way to Be!—not to mention a copy of the spring 2005 issue of BYU Magazine: “24 Hours at BYU.” More memorabilia from students, faculty, alumni, and friends of the university can be found inside—a great deal of it stored on the capsule’s iPod—along with a copy of the book of donors that was given to President Hinckley at the dedication. 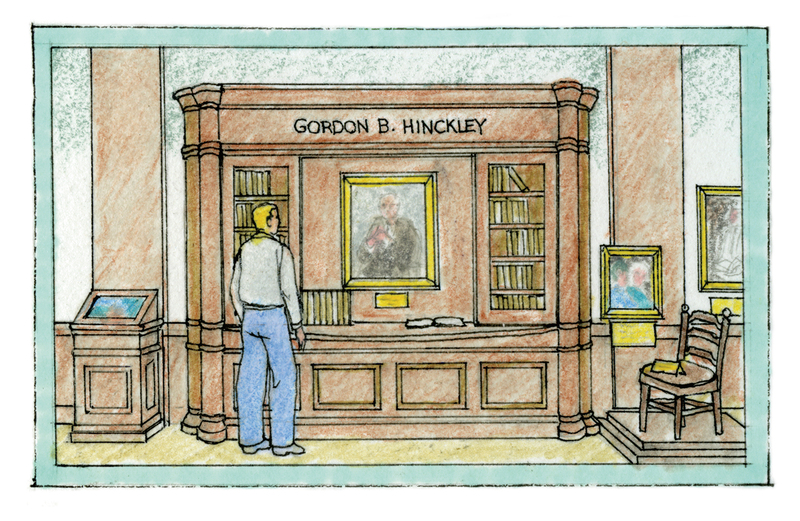 Floor-to-ceiling bookcases, about 14 feet tall, blanket an entire wall inside the Hinckley Center library. Those shelves will gradually fill with books connected to BYU, encompassing those written by alumni and faculty and just good old BYU nostalgia. Curl up with an old Banyan in a cozy armchair, or hop online at one of the computer hubs. It’s the perfect place for a former or potential student to learn more about BYU. A potpourri of events and meetings will take place in the east conference room. 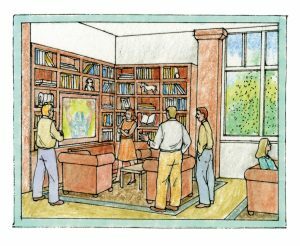 It can be reserved by any department on campus or by official alumni groups, and it will house the Alumni Association Board’s meetings this fall. Outfitted with a media cabinet—complete with a large drop-down screen—the room seats 90 for a lecture-style event, or it can be divided into two rooms. 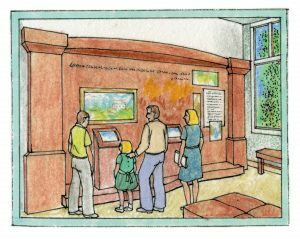 In the area dedicated to the building’s namesake, you can peruse titles from the personal library of President Gordon B. Hinckley, admire a newly commissioned bronze bust of the prophet, or explore a kiosk with video productions about his life, family, and ministry. You’ll also find the shovel President Hinckley brought from home to use in breaking ground for the Hinckley Center. And the walnut tree that once stood in his backyard—the same one used to make the Conference Center pulpit—provided wood detailing on the building’s central staircase railing. A touching object featured here is a chair President Hinckley’s wife, the late Marjorie Pay Hinckley, loved. The ladder-back antique has a needlepoint seat sewn by her mother, Georgetta Paxman Pay. It represents the endowed academic chair established in Marjorie’s name in the BYU College of Family, Home, and Social Sciences in 2003. Its placement in the Hinckley Center is a nod to a comment made by the prophet a year ago. 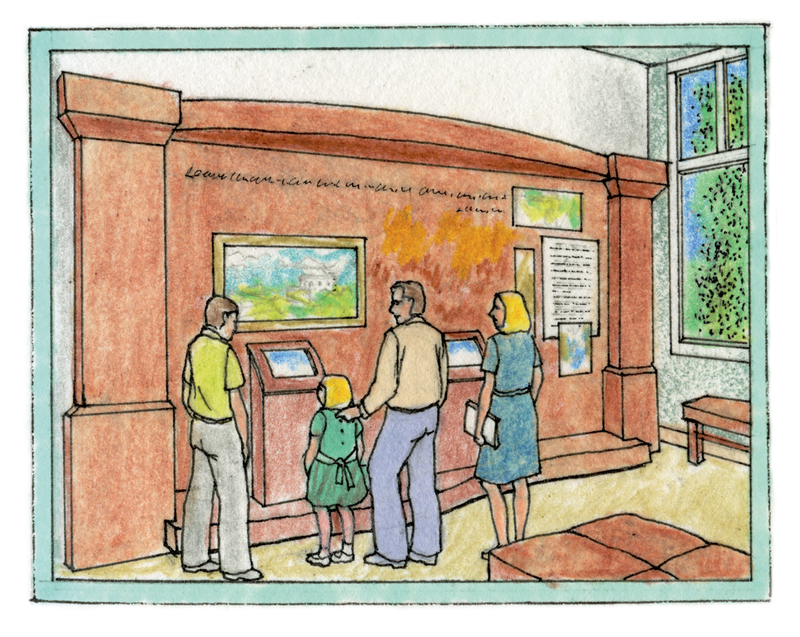 A portrait of the Savior and a depiction of Joseph Smith’s first vision greet you upon entrance into the John Franklin Shelley Visitors Center. Archival photos illustrate the history of Brigham Young Academy as you are led through the spiritual and educational foundations of the university and into the BYU experience of today. A colorful exhibit including video and touch screens—and an actual student-engineered race car—acquaints or reacquaints you with the joy found at BYU in educating the whole person. Displays depicting the variety of student “classrooms” at BYU illustrate how academics are enhanced by performing arts, sports, and service. And a glimpse of what alumni have done shows how they can spread their light in the world. The visitors center theater will show, among other BYU-related films, a new 10-minute documentary that will convey the commitment and vision that sustained the founders of Brigham Young Academy through poverty and hardship. “The film is a way to help alumni and friends of BYU connect with our rich heritage and with the individuals who shaped and guided this institution through years of struggle,” says Julie Harker Walker (BA ’93), the documentary’s producer and director. BYU’s 360,000-plus alumni have a new campus home. 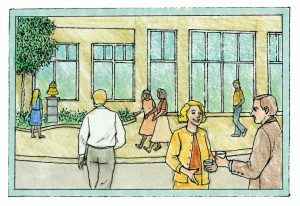 Fortunately, the 83,000-square-foot Gordon B. Hinckley Alumni and Visitors Center provides plenty of space for BYU’s immense family. Alumni Association president J. Craig McIlroy (BA ’78) says the Hinckley Center will create a distinctly BYU atmosphere. “We, for months, have been very excited about what we’re going to be able to do with this new facility to help cultivate the spirit of the Y,” he says. In addition to hosting Homecoming and other activities, the building provides office space for managing dozens of alumni programs (see list below). Volunteer alumni leaders will conduct meetings there, and all alumni will be welcome to use the business center, read an old Banyan in the library, or relax in the family room. “This will truly be a gathering place—for everyone,” says Linda M. Palmer (BS ’71), executive director of the Alumni Association. From Boston to San Diego, Norway to Madagascar, BYU alumni are joining forces to serve others and renew their school spirit. Affinity chapters link alumni by the organizations they were involved in at BYU, from academic emphases to clubs. Four organizations unite alumni based on their phase of life: Student Alumni Association, Young Alumni Association, Single Alumni Association, and Emeriti Alumni Association. 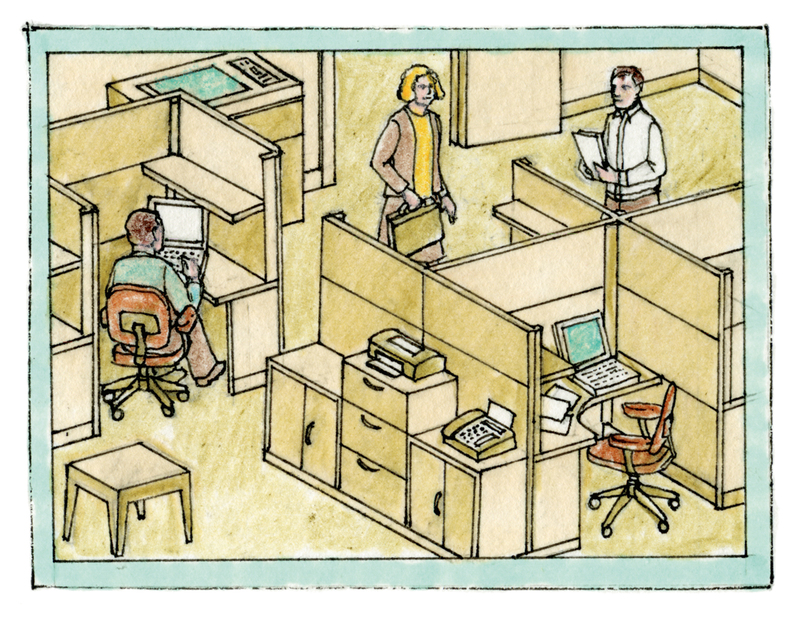 The alumni records office keeps tabs on hundreds of thousands of alumni. Updated address information allows alumni to receive BYU Magazine and goes into the password-protected online alumni directory. Alumni can also come to the alumni records office to pick up their free Alumni Card, which gives them discounts to many BYU services and events. Through the alumni Web site, BYU grads can order BYU merchandise and find discounted insurance rates. For hundreds of other items (from books to clothing), the Alumni Association has partnered with GreaterGood to have a portion of the purchase price donated to BYU. On the second floor of the Hinckley Center is a business center, which offers use of computers, Internet access, and fax machines to assist alumni in their efforts of lifelong learning and career development efforts. 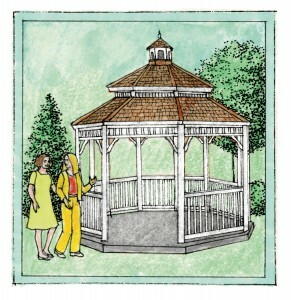 It will also allow alumni to stay in touch with life and careers at home while visiting campus. 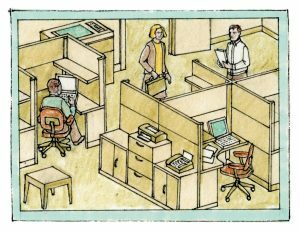 The Alumni Association offers a wide range of employment resources for BYU grads. Alumni can browse job postings by category, region, or salary; match their abilities and interests with current openings; post job openings at their companies; and even network with other alumni in their fields. During Parents Weekend each fall, parents spend quality time with their students, mingle with faculty members, attend athletic and cultural events, and experience a taste of life at BYU. The Alumni Association awards educational grants based on merit and need, with the expectation that they will be paid back in time, allowing future students to benefit. Students apply for the grants through the Scholarship Office. You don’t have to be an alum to enjoy the stress-free planning, the inspiring sites, and the spirit of the Y that alumni travel groups experience. The Alumni Association offers several tours every year. In addition to Church history sites, tours include cruises to Alaska and the Caribbean and outings to BYU football games. Web: For information on alumni services and programs, visit alumni.byu.edu, where you’ll also find the alumni directory and a calendar of alumni events. 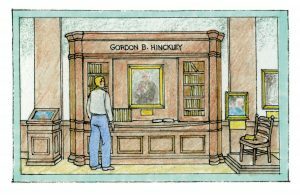 The Hinckley Alumni and Visitors Center stands as a tribute to the beloved prophet—this is its story.